Carbon fiber is incredibly light in addition to being stronger than steel, a seemingly perfect fit for a contact sport with safety issues such as American Football. 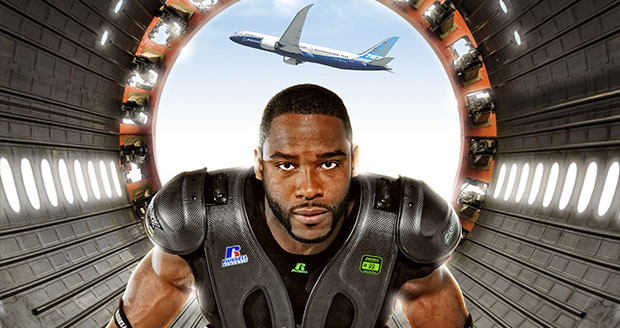 Russell Athletic has teamed up with Boeing to develop brand new carbon fiber shoulder pads which feature a breathable, protective compression vest under the shell of aeronautical-grade 787 carbon fiber. The new shoulder pads were specifically designed to disperse impact throughout the torso, in an attempt to minimize injuries and increase safety not only in games but also in practice. According to Russell Athletic, their pads weigh 10 percent less than traditional ABS-plastic and EVA-foam shoulder pads. “We are thrilled to partner with Boeing and discover new ways to utilize carbon fiber used on the 787 to make innovative, game-changing products for the sports industry,” said Robby Davis, senior vice president and general manager, Russell Athletic.